Having a greenhouse is a welcome addition for many backyard gardeners. Starting plants from seeds can be a rewarding and cost-effective way to get a jump start on all your summer planting. After looking closely at the market, we have found that the Gardman R687 4-Tier Mini Greenhouse is the best mini greenhouse around. It is roomy enough for all of your plants, but won’t take up a lot of space in your yard, patio or deck. The clear plastic cover allows you to view all your plants without opening the door. It includes a really nice anchor system to protect it against the wind (a huge bonus), and replacement covers are easy to get. For a full review of the Gardman R687, see below. If the Gardman just isn’t your cup of compost tea, we would suggest you check out the Blissun 4-Tier Mini Greenhouse. This mini greenhouse is a solid best-seller on Amazon, and that’s always a good sign! We liked this one because the polyethylene cover fits like a glove, making the door easy to zip. It’s also a breeze to assemble, taking as few as five minutes and no tools. For more information on the Blissun, see our Product Reviews section below. 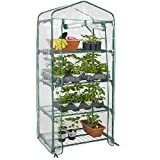 For those of you that are really watching your nickels and dimes, you’ll love the GOJOOASIS 4-Tier Mini Portable Garden Greenhouse. But, don’t let the low price fool you—they might have skimped on the price but not the features! This little beauty is portable, and works great! For a complete review of the GOJOOASIS, see below. A greenhouse is a great way to extend the growing season, or to have a cozy place to overwinter plants you want for the following year. However, polycarbonate greenhouses are quite expensive, and even walk-in plastic ones can be pricey. If you don’t have a ton of money or a lot of space, a mini greenhouse could be the perfect solution. But, with so many options that all look and perform very similarly, it can be challenging to decide which one is the best choice. Today we’re going to be reviewing and comparing six mini greenhouses, and out of the those we’ll choose: the best choice, a runner-up, and a budget choice to take some of the guesswork out of deciding which one would most fit your needs. You may find that a garden irrigation system is a great pair to a mini greenhouse, and makes quick work of watering all your plants! Starting us off is the Best Choice Products 4-Tier Mini Greenhouse. This small space gardening system will certainly help you get your plants started earlier in the season, or extend your planting time a little later into the year. The Best Choice Products four tier mini greenhouse greenhouse consists of two parts: a frame made from powder-coated steel, and a polyethylene cover. It has a compact design yet provides plenty of room for pots and seedlings and comes in an attractive green color. The steel frame is powder coated, and is quite rust resistant. The Polyethylene cover provides heat and protection. While it is reasonably robust, it will likely degrade over time, especially if left out in the elements. 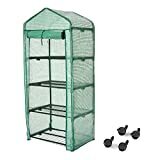 The Best Choice Products 4 Tier Mini Greenhouse has four wire shelves that can be removed for larger plants if needed and features a roll-up zippered door in the front for easy access. This mini greenhouse can be used inside or out and is easy to assemble—no tools required. The shelves aren’t attached but sit on top of crossbars. You can use zip ties (purchased separately) to secure the shelves, adding a great deal of stability. It also features a 60-day “no hassle” warranty, which is a help, but it’s not an earth-shattering warranty! On the negative side, as with all these mini greenhouses, it cannot hold up well in windy conditions. If you’re going to keep the Best Choice Products Greenhouse outside, it is recommended that you find some way to anchor it. The best ways to secure it is by attaching it to a building or fence or putting heavier items on the bottom. Even though it claims to be an “all season” greenhouse, you will extend the life by not leaving it outside in extreme weather conditions such as high heat (three-digit temps) or subzero temperatures. The Best Choice Products 4 Tier Mini Greenhouse is a good mini greenhouse for the price. It’s fairly well-constructed and can be made even more stable with a few zip ties as well as finding a way to anchor it for windy conditions. The 60-day “no hassle” warranty is a somewhat nice added feature. The GOJOOASIS 4 Tier Mini Portable Greenhouse easily wins the top spot in our Strangest Name for a Greenhouse category. Fortunately, it’s not just an oddly named product — it’s also a really nice, inexpensive greenhouse! Offering portability due to four included casters, this greenhouse is great for those who want to move their plants around throughout the day, or throughout the season. Shelves can hold up to 24 lbs. Shelf weight capacity: 24 lbs. As with the previously reviewed greenhouse, the GOJOOASIS mini greenhouse is a pleasing and earthy green color, and is virtually identical in size. But because of the inexpensive cost and nice feature set, comparatively, we picked this greenhouse as our Best Budget Choice. With plenty of room on the shelves for your seedlings and pots, and the added security of knowing the weight limit of the shelves, this is a good choice for the backyard gardener on a budget. And we love that it has casters, so you can move it around! The GOJOOASIS features the same zippered front door common to virtually all mini greenhouses, and offers easy access to plants. It can be used inside or outside. As with the first greenhouse on our list, it’s important to note that if you plan to use it outside, it’s best to anchor it by securing it to another structure or using heavier objects on the bottom shelf. And it bears repeating—zip ties are your friends! We especially like these 8″ zip ties from Sunshades Depot. The GOJOOASIS 4 tier mini-greenhouse is a great little greenhouse for those gardeners watching their pennies. It is aesthetically pleasing and functional. These greenhouses are all light and easily movable, and because of this you want to be careful about using it outdoors — it can sail away on you on a windy day! If necessary, consider some of the options in our guide to securing outdoor furniture. By taking the extra precautions to protect it from wind and extreme weather conditions, you can greatly increase its useful life. The Gardman R687 4 Tier Mini Greenhouse is an outstanding garden tool, well designed, constructed, and supported by Gardman. It features most of what the competition offers, but is a little more refined than the others on our list, making it our top choice. This little cutie won the top spot on our list, making it the Best Mini Greenhouse of those reviewed. It achieved this level because of its durability, and the addition of the guy ropes and stakes which allows the user to anchor it in place. This is a huge feature, considering the lightweight nature of these mini greenhouses. In addition, if you need a replacement cover after a couple of seasons, you can easily order one through Amazon. The frame is constructed out of the same powder-coated steel as the other two reviewed so far, and the polyethylene cover is clear for easily viewing your plants. It also features the same front zippered door and spacious mesh shelves. Useful indoors or out, this mini greenhouse will certainly be a welcome addition for your gardening enjoyment. The Gardman R687 has a relatively sturdy construction and an affordable price. The main distinguishing feature that brings it over the top is the fact that it can be anchored! We also like that replacement covers are easily available. As with the others on our list, using a few zip ties (like these Sunshade Depot ones) to secure the shelves will give it additional strength and stability. It’s roomy enough to accommodate many seed trays and pots to get an early start or prolong the growing season. The Blissun 4 Tier Mini Greenhouse is yet another high-quality mini greenhouse that works great for extending your growing season on both ends. With a well-built frame and a nicely made cover, this unit is great for virtually all gardeners! The Blissun greenhouse is easy on the wallet and the eye, especially with its clear plastic cover that allows you to see all your lovely plants growing away! Its compact design is perfect for small spaces, yet the shelves are roomy enough to hold several trays of starts or potted plants. If you have a taller plant, simply remove a shelf for more headroom. This greenhouse is a breeze to assemble—only five to ten minutes—and includes easy to follow instructions. One of the nicest features of this greenhouse is the cover fits perfectly, yet is loose enough that you won’t have to struggle with the zipper. With super easy assembly and a great fitting cover, we had to make this our Runner-Up. Of course, as with the others— Zip ties can help shore up the shelves, and if you’re planning to use it outside, be mindful of inclement weather and windy conditions. Take the proper precautions. This way you can prolong the life of your mini greenhouse to provide years of service. The Blissun Mini Greenhouse is positioned at a good price, is attractive, and is a snap to put together. You’ll be growing beautiful plants in no time! The cover fits better than many similar greenhouses on the market, which reduces the strain on the zipper to provide a lot longer usage before needing to replace it. Best greenhouse for cultivating seeds, young plants and rare flowers. Ideal for small space as places on a deck, patio, or balcony. Enjoying a lot of fun of the flowers and plants in your leisure time! The Ogrow Ultra Deluxe 4 Tier Mini Greenhouse features a very similar design to many of the other units on our list, and while it is a solid option, there’s nothing particularly Ultra Deluxe about it. It will help you get that garden going, and works well both inside and outside, which is pretty great. It has a fairly high capacity for plant storage and is quite easy to assemble, which is always a good help. Sturdy and dependable, the OGrow Ultra 4 tier portable greenhouse can hold lots of seedlings and several pots. It comes in an attractive green color with a clear cover to easily see all your plants, and its front zipper door offers access to everything inside. The shelves, like the others reviewed, are not adjustable, but you can remove a shelf if you need more headroom for taller plants. This greenhouse is easy to assemble with no tools required (a rubber mallet is handy for making a snug fit) and includes simple to follow instructions. Although it can be left outside year round, care must be taken in severe weather and it’s best to secure it against windy conditions. You can use zip ties to secure the shelves for more stability. The Ogrow Greenhouse is a dependable choice for a portable greenhouse, but it doesn’t quite stand out compared to some of the others on our list. Use it inside or out to house your plants and seed starts. Whether you want to save money by starting your own seeds, or if you want to extend the growing season as long as possible, this greenhouse provides what gardeners crave—more time with their plants. 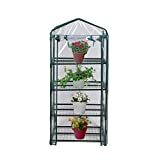 The Finether 4 Tier Mini Greenhouse is an attractive, fully featured mini greenhouse that balances a lightweight frame with solid structure, and shelves capable of holding a good deal of weight. This portable greenhouse includes locking casters, so it is quite easy to move this greenhouse around to catch the light where you need it! The Finether lightweight and portable greenhouse can be a nice addition to any gardener’s growing toolbox. The casters are great for moving it around—either chasing the sun or retreating from it. It is relatively well constructed for something so light (only 9.5 lbs.) and it’s easy to assemble without tools. This unit comes with internal ties to secure the cover to the inside frame and has a full zippered front door for easy access. The manufacturer offers wonderful customer service—if you have any trouble with the product (missing or damaged pieces etc.) they are prompt and friendly at addressing your needs. However, the casters can be difficult to install and are not removable. All in all, the Finether 4 tier greenhouse is a good little greenhouse for the money. As with the others, care must be taken if you keep it outside. It is lightweight and easy to move, but fragility is an issue. Be sure to properly secure it when leaving it outside. This unit frame takes only a few minutes to assemble without no tool. We’ve looked at several mini greenhouses, comparing functionality and features. We hope this will help you decide which one best suits your needs. Our best choice was the Gardman R687 4-Tier Mini Greenhouse, followed by the Blissun 4-Tier Mini Greenhouse for our runner-up. Finally, we chose the GOJOOASIS 4-Tier Mini Portable Garden Greenhouse for our budget pick. Any of these choices will provide an extended growing season for your plants or save you lots of cash by growing your babies from seeds. With a little care and a few zip ties, you can enjoy years of gardening pleasure.